I think all of the excitement and staying up late watching the Olympics wore me out. I wish it was a rainy day so I could curl up in bed and read. This photo was taken during a cruise of the fjords in Oslo, Norway. It was a gloomy day. A good day to stay in bed and read. 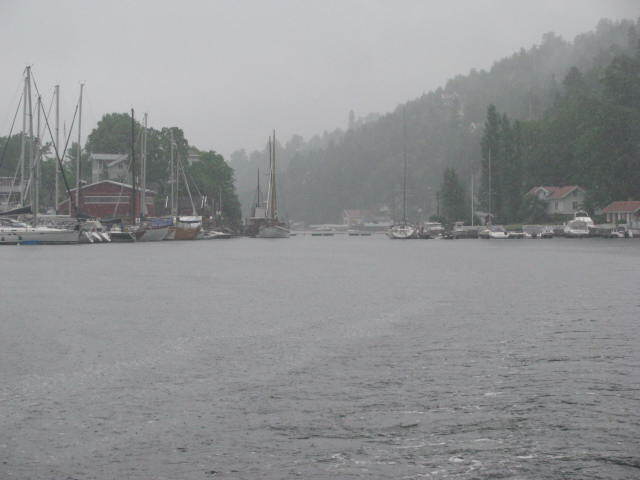 This entry was posted in Travel Photos and tagged 50 Year Project, Cruising the Fjords, Fjords, Gloomy Weather, Life, Nature, Norway, Oslo, Photography, Rainy Days, Travel, Travel Journal, Travel Photo. Bookmark the permalink. I wish for rainy and gloomy days sometimes too. Just so I can read, get caught up on blogging stuff and snuggle with my kids without feeling the need to get up and out. Just pretend it’s a rainy day and do it anyway :). I’m on my last day of holidays, so I’m trying to relax and read, but chores keep getting in the way. As far as the Olympics go, I’m a little sad today because I miss getting my alerts on my iPad about results and medals :(. It seems too quiet now doesn’t it? My neighborhood is really quiet. When I took Miles for a walk, we didn’t have to wade through hundreds of people. I hate chores. Can you empty the dishwasher for me? I probably should mention that no one likes my cooking. If I want to go out to dinner, I suggest I cook. That does the trick. I’m better with laundry, but I don’t iron. I never iron. Ok, going out for dinner sounds good to me :). Me too! I saw a movie that took place in Mexico yesterday, and now I’m craving Mexican food. do you know a good place? Wow, that really is gloomy, it’s as though all the colour has been leached out! Leached out … I like that! I know just how you feel. 🙂 rest now, the Paralympics are just around the corner! I know! I hope to see some. We had so many of them and I don’t think I appreciated them enough. Come to Cape Town, it’s bleak and gloomy here today. I would love to watch the clouds over Table Mountain. Great photo, I’ve never been to Norway but would like to. I hope you do. I wasn’t sure what to expect, but Oslo turned out to be one of our favorite places we’ve visited. It would make a great setting for a book. Just watching the Olympics can really tire a person out with the excitement, anticipation, cheering etc., etc.! Great shot of your trip! It was tiring, but oh so worth it! thanks! I haven’t seen the ruins…so I’m game! I have a friend who lives in Norway. She invited me to come visit the last time I was in Europe, but I couldn’t as my schedule was just too packed. Maybe next time. I hope you had a fun time. I hope you go. It is a wonderful place! It was a gloomy day. I have to admit though, I love gloomy, rainy days. As long as I can stay somewhat dry.